Pogo Alert+ GPS and Laser based speed camera detector provides alerts to all fixed and mobile locations such as Gatso, PEEK, and Monitron cameras via a built-in GPS database and plug-in laser detector. The Pogo Alert Plus comes pre-loaded with it's camera update software, so there's no need for a CD-Rom to be used to install the software. Plus it's both PC and Mac compatible. Pogo Alert Plus has been discontinued. Accessories are still available for your Pogo Alert Plus click here. 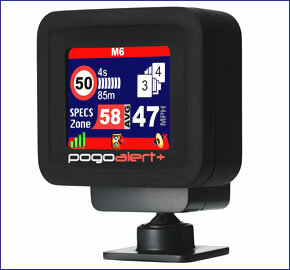 Pogo Alert Plus GPS and Laser based speed camera detector will confidently alert you to approaching fixed and mobile speed camera locations. On approaching a speed trap the Pogo Alert+ provides warnings via both it's 1.8-inch colour touchscreen and as an audible alert. When no hazard is in range the Alert Plus displays your vehicles current speed via an on-screen GPS speedometer. ‣OLED touchscreen - provides darker black levels, richer colours and better contrast than LCDs, making images and icons, etc, look smoother and more natural. ‣Rechargeable battery - providing up to 8 hours operation. The Pogo Alert Plus provides speed trap alerts either via the updatable GPS database or via the highly sensitive infra-red laser detector. Using the laser detector the Alert Plus provides alerts to live 'in-use' mobile laser guns. The plug-in laser detector can also be removed when not required or when the using the Alert Plus in countries where there usage is deemed illegal i.e. France. N.B. The use of a laser detector is completely legal in the UK. The 1.8-inch OLED (Organic Light Emitting Diode) screen provides all the information you need about an approaching speed camera. By glancing at the Alert Plus's screen (as pictured left) you can see the camera type i.e. GATSO, your speed i.e. 61MPH, the camera enforced speed limit i.e. 60MPH, the road number where the camera is located i.e. A37 a countdown in both seconds and metres to the exact speed traps location, and finally if you're driving below the posted speed limit the screens top and bottom remains blue, but if you're traveling too fast the screen top/bottom changes red, alerting you further. The Pogo Alert Plus comes with 6-months free speed camera subscription when purchased from ActiveGPS. Updates are via either a PC or Mac (an industry first) with Internet connection. Subsequent subscription is priced at £50.00 a year. Pogo Alert+ available from ActiveGPS will be the very latest version - v4 - Pogo/Road Angel Group are not calling it Version 4, but latest stock will as we understand it have the latest hardware, firmware and software updates. To avoid confusion and since other retailers are using the designation "v4" , "Version 4" and "2013 model" we have decided to also use those terms. We are also a Pogo/Road Angel approved reseller, so you can be rest assured that you are buying a genuine Pogo product with full support. Do you have a question about the Pogo Alert+ that's not been answered on this webpage? Please see our speed camera detector FAQs for questions from other customers and visitors. Plus if the answer to your question isn't featured, use the online form to ask us for the answer. Alternatively please telephone 01733 777623 Monday to Friday (9:30am-5:00pm) to speak to one of our sales team. Pogo Alert Plus can either be installed to the windscreen or dashboard of your vehicle and both options are included in the box as standard. This plug-and-play ability makes it easy to move the Pogo Alert Plus from vehicle to vehicle. The Pogo Alert+ includes an internal rechargeable battery providing up to 8 hours use. The Alert Plus also comes complete with an in-car charger, so if you run low on power you can power/recharge the battery from your vehicles cigarette lighter adaptor, whilst still receiving alerts and warnings to speed camera locations. Pogo Alert Plus is pre-loaded with update software, so there is no need for a CD-Rom to be used to install update software on either a PC/Mac. Pogo Alert Plus comes with a free 6 months safety camera subscription, thereafter an annual fee of £50.00 applies. This data can be simply downloaded to Pogo Alert Plus via a PC or Mac with Internet connection. System requirements: Windows: XP, Vista or Windows 7. Mac: OS X. A very limited range of genuine Pogo Alert Plus accessories are available to buy from ActiveGPS.